Objects of cold fish in Japan are rainbow trout, trout, freshwater form of chum salmon. The greatest effect is the farming of rainbow trout, as the growth rate it higher. In fish farms grow local, Japanese form trout — malema that in the stage of fry produced in natural waters as an object for sport fishing. We visited one of the stations of trout breeding, founded in 1877, which is located on the small mountain river in a narrow valley surrounded by mountains. The water temperature is the whole year a constant 12°. Station annually implementing an average of 60 tons of commodity trout dvuhletki average weight 1.2-1.3 kg, 2 million pieces of fingerlings and 10 million fertilized eggs (stage eye). Here is a large selection and breeding work aimed at the acceleration of ripening of sexual products trout. Scientists were able to obtain calves from two year old animals. (In natural conditions the trout become sexually Mature at the age of three years). The station bred trout, giving the eggs 2 times a year — spring and fall. Scientists are working on prevention of fish diseases, developing new treatments and studying the biology of the species and identify the causes that lead to colouring of the muscles of the fish. The Japanese prefer to eat fish with red muscles. There is also a testing ground for new types of feed. In connection with the constant increase in prices on fish flour and fish farmers replace it with 20 % flour from feathers supplied by broiler factories. The application of this substitute does not affect the growth rate of trout. The station is constantly a lot of tourists for a small fee, get acquainted with her work, visit the local Museum of the fish. In a small restaurant, located on the territory of the station, try delicious food from different fish, skillfully prepared by local chefs. The number of employees at the station 17 people, 11 of whom are engaged in cultivation of trout, and the rest accept and serve tourists. Juvenile trout get in a small incubation shop with the gravity supply from the river. For the incubation of eggs use conventional gutter machines that are installed vertically at ten wooden frames measuring 25×30 cm covered with nylon mesh with a mesh of 2 mm. On each frame put 2 thousand fertilized eggs. Incubation lasts 80 days at a water temperature of 12 degrees. Newly hatched larvae, with the transition to external power, kept in these trays without frames to average weight 1 g fingerlings are Then transplanted in concrete pools, where were grown during the summer, sorting them by size. Yearlings trout are grown in the cascade of small instream ponds, arranged by repeatedly partitioning the river, below Picanol part of the station. The release of fingerlings is 60 % (if no diseases), the output of dvuhletki — 80-90 %. 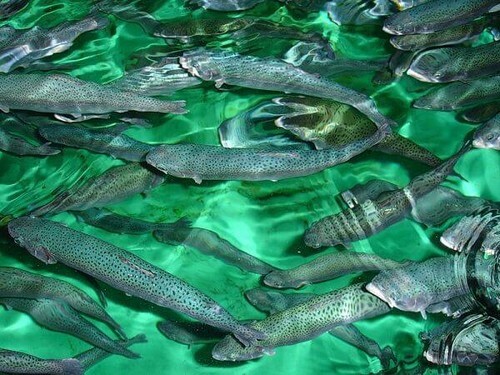 Juvenile trout are fed forage with a protein content of 45 %, dvuhletkami give a granular feed that contains 42-43 % protein, 3-4 % fat, 16 % ash. Before feeding feed add 5 % fat Pollock by weight of the dry granule using for the preparation of mixtures of ordinary cement mixer. The granules are not destroyed. Commodity trout fed 2 times a day, at the rate of 4-5% of feed by weight of the fish. To increase 1 kg trout spend of 1.5-1.6 kg of feed. Low feed consumption per unit growth of farmed fish due, first, high-quality feed that contains all the vital ingredients, including a complete protein; second, the high a grinding component, in which small fractions (grits) with maximum fullness digested and assimilated in the body of the fish, and, thirdly, high strength and water resistance of granules, with the result that nutrients are not washed out of the feed and completely consumed fish.